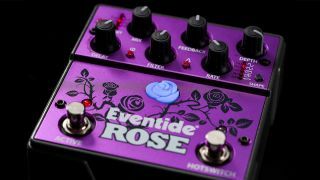 NAMM 2019: With the H9 covering just about every effect need, it’s been a long time since we’ve seen a standalone Eventide pedal release, but that dry spell has come to an end with the launch of the innovative Rose delay pedal. Designed to combine analogue and digital delays, the Rose features invert phase and reverse delays, a Delay Multiplier, analogue lowpass filter and five different modulation sources. There are also five presets, MIDI control and an assignable aux switch/expression pedal, with up to 10 seconds of delay at 200kHz, or even 50 seconds of delay at 8kHz. Eventide reckons the Rose’s tones are “unattainable by solely digital means”, so we’re expecting something truly unique here. There’s no word on availability or price yet, but you can pop over to Eventide for more info should you so desire.